The hypothetical inability for a viewer to distinguish reality from fantasy in design – which is known as the term ‘Hyperreality’ in the field of Semiotics (the study of signs and sign processes) – influences the work of designers, potentially offers a useful tool that designers can employ in print, multimedia, and web design, and helps designers achieve a specific response for their client(s). This definition is somewhat based on the book Hyperreality: Paradigm for the Third Millenium by Nobuyoshi Terashima and John Tiffin, wherein they describes Hyperreality as “ongoing research into areas such as the design of virtual worlds and virtual humans, and the role of intelligent agents;”  however, this perspective is looking at Hyperreality solely from a technological standpoint, and not so much from a semiotics standpoint. When one looks at the history of Semiotics, or more accurately Semiology, they will find out that it is a discipline developed early in the twentieth century by anthropologists, linguists, and philosophers who were interested in where words originated, and how those words transformed over time. This ongoing investigation found many scholars contributing to the field of Semiology from the perspective of their social environment, and therefore it is more of a discipline of study rather than a defined ideology. A key part of Semotics is that there a two components in every ‘sign’, the Signified and the Signifier. The Signified is the concept for which the sign stands, whereas the Signifier is the sound or image that represents the concept of the sign, both of which have been utilized by designers in iconography, logo design, and product sales. For example, in the United States of America when someone when someone hears the Signifier ‘I’m Loving It’, or globally when someone sees the ‘Golden Arches’ (Figure 1), they know that it is the fast-food business McDonalds that is Signified. 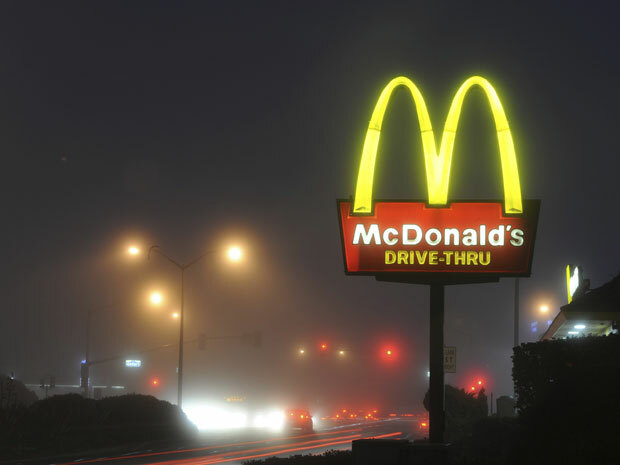 Studies have been completed stating how the ‘Golden Arches’ are a global cultural signifier, and is viewed as an exploitative company, a target for anti-globalization activists, and contributes to labor exploitation (Kincheloe 20). Despite individual connotations that people have concerning McDonalds, the fact remains that the ‘Golden Arches’ (the McDonald’s logo) remain a global cultural signifier. Fig 1: Jan S. Astani, mcdonalds2, 2012, digital photograph, 620 px. by 465px., janastani.wordpress.com, http://janastani.files.wordpress.com/2012/04/mcdonalds2.jpg (accessed July 4, 2013). Even though McDonalds has been proven to be a completely unhealthy fast-food eatery that is notorious for its high employee turnover rate due to low wages, the marketing and public relation design doesn’t indicate this at all; in contrast, consumers and customers of the restaurant see it as being associated with ‘socially accepted’ values like family, views of the past, culture, and home. Kincheloe further states that due to McDonald’s marketing campaigns, younger consumers “unconditionally follow the company’s innovations and become the most faithful consumers.”  This is a fantastic example of how logo design, branding, and public relations can create a Hyperreal experience in the mind of a consumer, simply through the use of the ‘Golden Arches’. Another successful example of Hyperreality that is being used by communication, marketing, and public relation designers is with the Disneyland franchise and theme park (Figure 2). The Semiotician Umberto Eco – who is also an Italian, essayist, philosopher, literary critic, and novelist – lectures and writes extensively concerning Seiotics and Hyperreality, and utilizes the metaphor of Disneyland versus a wax museum to explain the concept of Hyperrerality. Fig 2: Disney, magic-kingdom, 2010, digital photograph, 600 px. by 404 px., everythingforyourchild.wordpress.com, http://everythingforyourchild.files.wordpress.com/2010/05/magic-kingdom.jpg (accessed July 5, 2013). In Eco’s book Travels in Hyperreality he explains “in this sense Disneyland is more Hyperrealistic than the wax museum, precisely because the latter still tries to make us believe that what we are seeing reproduces reality absolutely, whereas Disneyland makes it clear that within its magic enclosure it is fantasy that is absolutely reproduced.”  The meaning here, and the subtle difference, is that the wax museum doesn’t hide the fact that it is a reproduction of life; whereas, Disneyland’s very construction is an unreal reality, or Hyperreality, that is meticulously constructed through branding, design, public relations, packaging, employee training, and products. 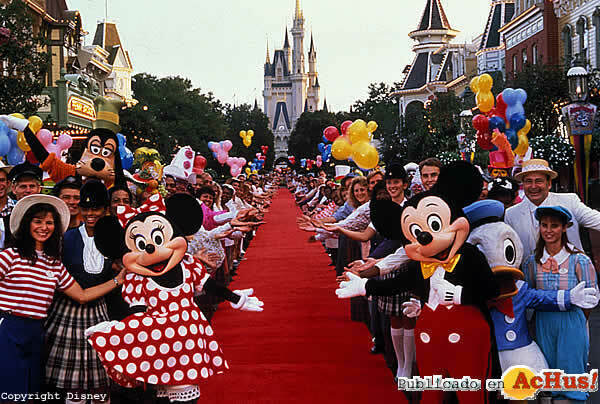 This Disney Hyperreality is unequaled to almost any other due to the fact that Disney is a theme park, production house, manufacturer, film company, and television channel. In its own regard Disney creates a normalcy of reality, and the reality of fantasy, all through creating a self-contained Hyperreality and experience that is known as ‘the magic of Disney’. Yet another example of how Hyperreality that is utilized by designers can be described in the works of Jean Baudrillard, a French sociologist, philosopher, cultural theorist, political commentator, and photographer. Baudrillard’s work utilized “semiology to analyze how objects are encoded with a system of signs and meanings that constitute contemporary media and consumer societies.”  In the book Simulacra and Simulation Baudrillad concludes that “everywhere the Hyperrealism of simulation is translated by the hallucinatory resemblance of the real to itself,”  and so a great example of design simulation appearing like reality can be seen in Skeuomorphism. Skeuomorphism refers to both a digital element designed to look like something from the physical world, or an object that retains ornamental design cues to a structure that was necessary in the original object. The term is applied to material objects since 1890 C.E., but now the term is used by designers to describe application, computer, and website interfaces, also known as User Experience or User Interface (UX/UI). Looking at the many great examples of Hyperreality in design as Skeuomorphism, a lot of examples can be found in smartphone app development. A lot of smartphone applications utilize design interface and functionality of real-world aesthetics and mechanisms. 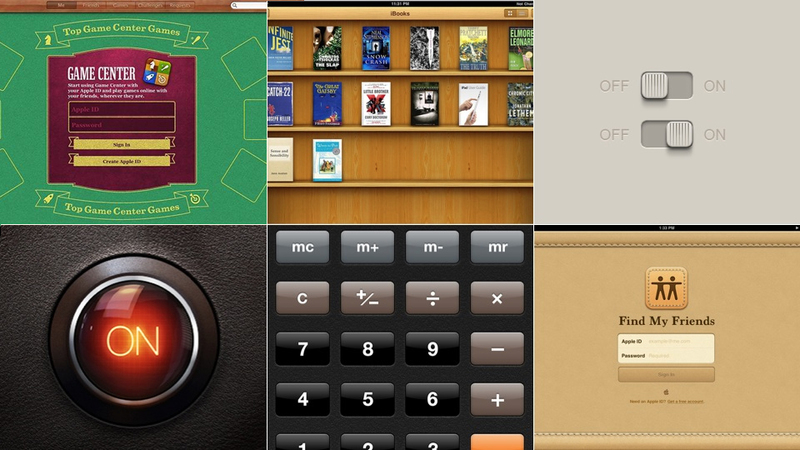 Examples of this are book shelves as a storage mechanism for a Kindle ebook app, touch-based interfaces that appear as light switches, levers, or real-world buttons on calculator apps, and textures like leather, cloth, and chalkboard for app backgrounds (Figure 3). Fig 3: Gizmodo, original, 2013, screenshot collage, 960 px. by 540 px., gizmodo.com, http://img.gawkerassets.com/img/18osjuqz1mehgjpg/original.jpg (accessed July 6, 2013). Utilizing Hyperrealism as a design technique in app UX/UI not only affords the viewer an ease of user experience, and a phenomenological relationship with the digital device, but also allows the designer to reduce the learning curve for viewers by simply employing a Skeuomorphic user interface. In conclusion, when looking at the three previously provided examples of design’s use of Hyperreality – in McDonald’s iconic logo, the creation of an immerse reality/fantasy-reality through ‘the magic of Disney’, and Skeuomorphic aesthetics and UX/UI in smartphone application development –the value of using not only Semiotics in design, but also Hyperrealtiy is apparent. Semiotic Hyperreality already influences the work of designers, offers a myriad of useful design tools, and ultimately helps designers achieve desired communication goals. “Hyperreality.” Last modified June 30, 2013. http://en.wikipedia.org/wiki/Hyperreality. WikiMedia Foundation, Inc.
Terashima, Nobuyoshi and Tiffin, John. Hyperreality: Paradigm for the Third Millenium. (London: Routledge, 2001), Abstract. Davis, Meredith. Graphic Design in Context: Graphic Design Theory. (New York: Thames & Hudson, 2012), 105. Kincheloe, Joe L. “The Sign of the Burger.” Harvard Educational Review: (Temple University Press, 2002) 213. Kincheloe, “Sign of the Burger,” 213. Eco, Umberto. Travels in Hyperreality (New York: Mariner Books, 1990), 24. Douglas Kellner. “Jean Baudrillard.” Stanford Encyclopedia of Philosophy, )Revised by Uri Nodelman and Edward N. Zalta: Stanford Publishing, 2007), http://plato.stanford.edu/entries/baudrillard/. Baudrillard, Jean. Simulcra and Simulation. (Michigan: University of Michigan Press, 1981), 12. Astani, Jan S. mcdonalds2, 2012, digital photograph, 620 px. by 465px., janastani.wordpress.com, http://janastani.files.wordpress.com/2012/04/mcdonalds2.jpg (accessed July 4, 2013). Baudrillard, Jean. “The Hyper-realism of Simulation.” Art in Theory 1900-2000: An Anthology of Changing Ideas, Edited by Charles Harrison and Paul Wood. Malden, MA: Blackwell Publishing, 2003. Baudrillard, Jean. Simulcra and Simulation. Michigan: University of Michigan Press, 1981. Davis, Meredith. Graphic Design in Context: Graphic Design Theory. New York: Thames & Hudson, 2012. Disney, magic-kingdom, 2010, digital photograph, 600 px. by 404 px., everythingforyourchild.wordpress.com, http://everythingforyourchild.files.wordpress.com/2010/05/magic-kingdom.jpg (accessed July 5, 2013). Eco, Umberto. Travels in Hyperreality. New York: Mariner Books, 1990. Gizmodo, original, 2013, screenshot collage, 960 px. by 540 px., gizmodo.com, http://img.gawkerassets.com/img/18osjuqz1mehgjpg/original.jpg (accessed July 6, 2013). Kellner, Douglas. “Jean Baudrillard.” Stanford Encyclopedia of Philosophy, Revised by Uri Nodelman and Edward N. Zalta: Stanford Publishing, 2007. Kincheloe, Joe L. “The Sign of the Burger.” Harvard Educational Review: Temple University Press, 2002. Terashima, Nobuyoshi and Tiffin, John. Hyperreality: Paradigm for the Third Millenium. London: Routledge, 2001. Wikipedia. “Hyperreality.” Last modified June 30, 2013. http://en.wikipedia.org/wiki/Hyperreality. WikiMedia Foundation, Inc.